Boxing is returning to the big screen. Monday, it was announced that the Sept. 19 bout between Floyd Mayweather and Juan Manuel Marquezwill be shown in more than 170 theaters nationwide (suggested price: $12.50 to $15) in addition to HBO-Pay Per-View ($49.95). Trailers will begin running for four weeks leading up to the bout. The entire card, which is shaping up to be one of the year’s best, will be shown from MGM Grand in Las Vegas. That includes a rematch between featherweight titlist Chris John and Rocky Juarez; former lineal welterweight champion Zab Judah vs. Antonio Diaz; former lightweight world title challenger Michael Katsidis vs. Vicente Escobedo. Although Schaefer said the last fight shown via broad closed circuit in the U.S. was Ray Leonard-Roberto Duran II in 1980, Oscar De La Hoya‘s first bout vs. Julio Cesar Chavez, promoted by Top Rank Inc. in 1996, was exclusively shown in theaters — not pay-per-view. Leonard’s superfight with Marvelous Marvin Hagler in 1987 was on closed circuit as well, but in the ’80s those fights occurred on Monday nights. Putting Mayweather-Marquez on closed circuit on a Saturday night, however, is unique. Theater tickets can be purchased at fathomevents.com. FILM producers spend millions every year to draw audiences to their movies. Now, advertisers are beginning to benefit from that, using not only movie screens for their commercials, but the lobbies of cinemas as well. Sprint is placing kiosks in about 500 movie theaters so customers can scan in a code from their phones to get coupons for snacks. This month through December, Sprint Nextel is sponsoring a cinema-centric marketing effort, placing kiosks in about 500 movie theaters nationwide. Sprint customers can scan in a code from their phones, and the kiosks will print coupons, like a free upgrade to a bigger popcorn or larger soda. “We see a very natural affinity between cinemagoers and our target audience,” said Simon McPhillips, director of media for Sprint. With more people going to see films, it’s a good time for Sprint to go to the movies, he added. Companies have been expanding their cinema advertising recently, realizing that theaters are good places to reach audiences that don’t have too many distractions. For years, companies like Screenvision and National CineMedia have been running on-screen commercials before trailers started, and lately they have been offering new products for advertisers. National CineMedia operates TV screens at concession stands that feature ads. Screenvision has a few new projects in the works: with Cinema Scene, it will expand the number of theaters featuring stand-alone digital panels that replace movie posters. They show trailers or images that can be changed every day, or even every hour. And it will also introduce a backlit ministage that displays a hologram later this year. These stages, about 8 feet by 8 feet, will be placed in theater lobbies, and marketers can use them to display any image they want, like a candy bar or a cellphone. Those are scheduled for limited introduction this year and are more for the “wow” factor than anything else, said Michael Chico, executive vice president for sales and marketing at Screenvision. Sprint, too, is becoming more creative with its cinema spots, Mr. McPhillips said. Sprint uses National CineMedia’s network to run what are known as courtesy spots — reminders to silence cellphones — just before the movie (this spring, it added a warning not to text during a movie). Screenvision and Sprint have conducted promotions that ask cinemagoers to choose the best-dressed celebrity from a red-carpet event via text message, or allow consumers to text a certain number and receive a trailer download in return. The idea is not to get moviegoers to switch phone companies then and there, but to show off what Sprint can do, Mr. McPhillips said. Sometimes, as in the red-carpet texting campaign, Sprint allows any cellphone customer to participate. But with the kiosk, Sprint has a different goal. “The first was a reward for their own customers, building that loyalty, and the other was the envy factor,” said Christine Martino, national account director for Screenvision, which brought the idea to Sprint. The kiosk works by instructing Sprint customers to text a certain word (like “Sprint”) to a certain phone number. The customers then receive a text message that includes a string of letters and numbers. The kiosk includes a computer screen next to a scanning device, and people hold up their cellphones, scan that code and can browse through a few offers on the screen. The customers select their offer, and the kiosk prints a receipt that people can take to the concession stand for free upgrades, like a larger popcorn. Ad spending kept growing in 2008 as so much else slowed. It was a down year for nearly every form of advertising, with everything from magazines to outdoor taking a hit in 2008. A notable exception was cinema advertising, which recorded its sixth straight year of growth, up 5.8 percent over 2007, from $539.9 million to $571.4 million, according to the Cinema Advertising Council. Spending on the medium has increased by 208 percent since 2002, the first year it was measured. In 2008 the bulk of the money, just over 90 percent, was spent on on-screen advertising versus advertising elsewhere in the theater. That’s down slightly from 92 percent the previous year. National or regional advertisers accounted for 77 percent of sales. Driving that growth is improved technology, which now enables advertisers to swap out and update creative digitally at the flip of a switch across hundreds of theaters. That’s made cinema advertising that much more attractive to marketers, especially national brands. While the media economy overall fell 2.8 to 4 percent during 2008, depending on whose figures you believe, cinema advertising still pulled in new advertisers. “We started digitizing seven years ago, and that made it easier for advertisers who had never explored cinema before to start using it,” says Dave Kupiec, president and chairman of the CAC. Under the old technology, creative had to be distributed to individual theaters in the form of film. On-screen advertising was sold in four-week chunks, which essentially precluded marketers who wanted to advertise a limited-time promotion, like a weekend sale. It was also cost-prohibitive, with a short spot running up to $300,000 to produce. Kupiec says cinema advertising saw some of its biggest growth in the retail area this year because of that technology, with advertisers such as Kohl’s and Sears coming in for the first time in recent years. Off-screen advertising, of the sort you see in movie theater lobbies, also saw some growth due to new interactive technologies, such as posters that send messages to passersby’s cell phones. Automotive remained one of the top ad categories in 2008, with Asian automakers spending especially heavily. Other top categories included television, consumer packaged goods, credit cards, fashion and movie studios. Still, whether the ad spending growth will continue into what’s been a dismal start to the year for all media remains to be seen. CAC members account for 82 percent of the nearly 39,000 U.S. movie screens. The studio had threatened to make theater chains pay the costs, which can easily add $10 million to a successful film’s release. 20th Century Fox‘s high-profile stare-down with exhibitors over who would pay for digital 3-D glasses to go with ‘Ice Age: Dawn of the Dinosaurs‘ has been settled. But the issues underlying the dispute will almost certainly flare up again. In the past, studios have paid 75 cents to $1 per moviegoer for disposable glasses. That can easily add as much as $10 million to the cost of a successful film’s release. This factor empowers muliti-use glasses solutions like XpanD or Dolby that eliminate this cost. It’s a sore point for studios, which complain that they shouldn’t have to pay that fee, particularly because theaters can reuse glasses. The studios are already incurring additional costs of about $15 million a picture to make a movie in 3-D. Tickets for 3-D movies come with a $2 to $3 surcharge, which is split between theater owners and studios. Fox was the first studio whose concerns became public, when word got out during the ShoWest film industry trade show in March that it was pressuring exhibitors to pay for the glasses to go with “Ice Age: Dawn of the Dinosaurs,” which comes out July 1 and is the studio’s first 3-D movie. Theater chains balked, with Regal, the nation’s biggest, threatening to play the movie in 2-D only. With nearly 50 3-D movies due out in the next two years, the issue of who will pay for 3-D glasses is hardly settled. 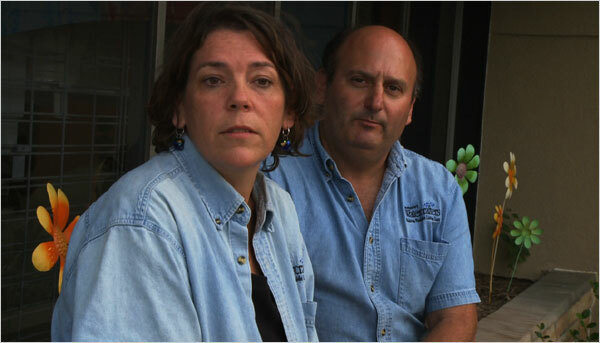 Howard Weiss and Kelly Reed, whose pool supply store was sued by a woman who had fallen. INSTEAD of the latest on Hollywood stars, moviegoers may get a dose of advocacy this month when they settle into their seats for the feature presentation. 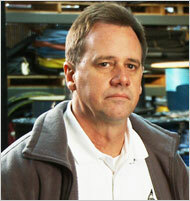 Mike Carter, whose gasket business in Louisiana is grappling with 100 asbestos lawsuits. Coming to theaters are commercials that are intended to spell out the perils of frivolous lawsuits as told by “everyday Americans,” including small-business owners who have been hit with costly lawsuits they believed were arbitrary and abusive. The owner of a pool supply store in Rockville, Md., tells of being sued for $750,000 by a passer-by who fell and was injured after being startled by a wild Canada goose nesting near his store. A gasket maker in Monroe, La., narrates how he is grappling with 100 asbestos lawsuits, and a Colorado couple describe how their family was sued for $75,000 after their 7-year-old son struck a fellow skier. The series of two-minute trailers is the latest salvo in a long-running political battle over whether there should be curbs on bringing civil lawsuits. President George W. Bush often criticized what he called “junk lawsuits,” but trial lawyers fought back, citing research by the RAND Institute and other groups that as few as 2 percent of injured people file lawsuits. The United States Chamber of Commerce, which represents three million businesses, is hoping this “Faces of Lawsuit Abuse” ad campaign, from its Institute for Legal Reform, can revitalize interest in restricting litigation. The tales, now running on radio, television and the Internet, will appear on the big screen for audiences in Washington, D.C., and in Colorado and Louisiana. The plan is to then expand to theaters nationwide. A handful of other organizations and government agencies have bought ad slots before movies. Groups like the American Diabetes Association and the American Heart Association have run issue or brand awareness ads or commercials in theaters. “This is the first time we’ve looked at movie trailers as a way to present an issue,” said Will Feltus, senior vice president for research at National Media Inc., which bought the lawsuit campaign’s media time. The company, based in Alexandria, Va., was a media buyer for the 2004 Bush re-election campaign. Mr. Feltus acknowledged being skeptical about such trailers because “they are a bit outside of the box,” but said that data from Scarborough Research, a major market research group, found that people who closely followed political issues were “well above average” in their moviegoing habits. “About 50 percent are more likely to go to the movies six or more times a month,” he said. Also, movies are attracting bigger audiences, with box office results up 15 percent this year over 2008. And 90 percent of audiences prefer preshow entertainment and advertising over a blank screen, according to E-Poll, a market research firm whose data is used by National CineMedia, which sells and places advertisements for Regal Entertainment, AMC Entertainment Inc., Cinemark Holdings and other theaters. The ads also are staking out new advertising ground, because the campaign plans to go national and because of the ads’ longer running time, Mr. Marks said. “Such ads, which we call branded entertainment, are usually 30 or 60 seconds long. The lawsuit promotion is a longer form, and costs more to produce and buy the time,” he said. The institute declined to disclose its budget for the campaign, but Mr. Marks said it would cost at least $1 million, and perhaps as much as $4 million, to place ads in its 1,325 theaters across the country. The campaign is not pushing any specific legislation, but Joanne Doroshow, executive director of the Center for Justice and Democracy, a consumer advocacy group, said the chamber was trying to fend off legislative changes to mandatory arbitration clauses. “They want to make sure that consumers don’t have the right to go to court when there are disputes in consumer contracts like health insurance, credit cards or mortgages,” she said. Ms. Rickard said the institute would gauge the effectiveness of its campaign from the response to its Web site, facesoflawsuitabuse.org. As it plans to expand the campaign nationally, the institute is looking for new participants from the “hundreds of stories we get on our Web site,” said Bryan Quigley, a spokesman for the group. Ms. Rickard said the public needed to be educated about such lawsuits because cases like the one involving the nesting goose were costly to business owners. The goose at the center of the lawsuit “was not a wild creature, but a pet because they were feeding it,” Mr. Malone said. Campaigns like those from Ms. Rickard’s group amount “to mass tampering with the jury pool so they look at any plaintiff with a skeptical and jaundiced eye,” he said. NEW – 3D ADVERTISING ON MOVIE SCREENS – IT’S HERE! 3-D Advertising Comes to the Silver Screen: Screenvision and Wrigley(R) Partner to Bring First Ever 3-D Ad to Cinema 3-D Advertising Comes to the Silver Screen: Screenvision and Wrigley(R) Partner to Bring First Ever 3-D Ad to Cinema: “Screenvision, the leading innovator in cinema advertising has partnered exclusively with the Wrigley brand to bring the first ever 3-D ad to cinema beginning May 1st. This exclusive partnership extends Screenvision’s focus to create 360 degree entertainment experiences for consumers and marketers alike. Already the 3-D in-lobby leader for advertisers, Screenvision will now also be the 3-D in-theatre leader with the launch of its first ever on screen 3-D ad.